The very enthusiastic, super smart & sweet Jimmy Ogle graciously shared some of his knowledge of Overton Park with a group of us on Sunday morning. Yes, he brought an easle and maps! We all really enjoyed hearing Jimmy's stories and learning more about the park. We had absolutely gorgeous weather, a number of new faces, and (as usual) lots of fascinating discoveries along our 1.5 mile hike. My new friend Jimmy, after only a few seconds in our company, said, "I'm already glad I came." I replied, "Awesome, now come every week because it is always changing in here." Not two seconds later, Naomi who was several yards away at the front of the pack said, "Everytime you come to the Old Forest, you see something new. Great minds think a like, I suppose. For the next hour we shook paw paws from trees, marveled at the woodpecker graffiti on a PFI trail marker, studied numerous vines, squeezed spice bush berries to smell their lemony goodness, stared up at the sun peeking through the gorgeous many-leafed canopy, crushed polk berries to see their iridescent stain, and so on. Just another day in paradise! 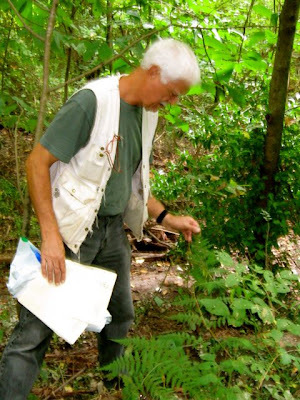 Join us this Sunday, September 28, 10am to 11:30am, as we hike the Old Forest with CPOP board member Jimmy Ogle. 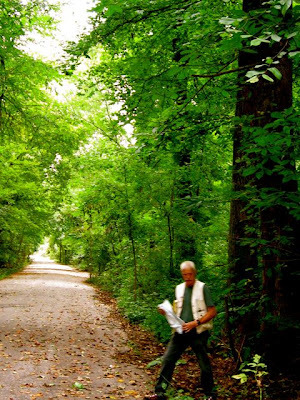 Our nature trails lack the manhole covers that Jimmy favors, but he's promised to bring historical photos and fascinating facts about the human history of Overton Park. We'll cover about 1.5 miles at a leisurely pace. Meet at the east end of Old Forest Lane, next to the Rainbow Lake parking area. Kids are welcome, as always. 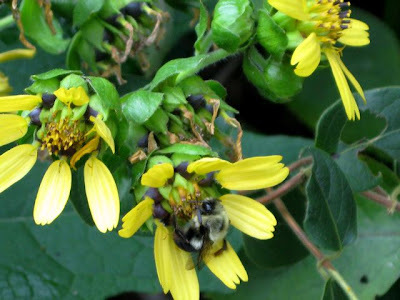 Mayor A C Wharton’s Sustainable Shelby is looking for digital photographs to advance the Sustainable Shelby initiative and be used in our upcoming Implementation Plan and website. 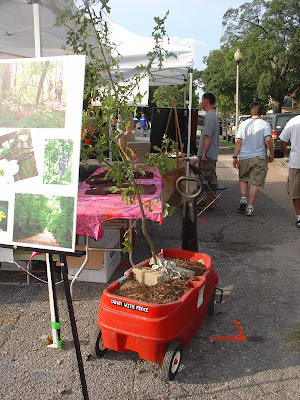 We need your help to capture images that will help us illustrate the importance of sustainability for the future of our community - the things and places that you love about Memphis and Shelby County. We are especially interested in "active" photographs that include not only local places but local people as well. If you’re an amateur or professional photographer, this is a great way to get your photography published and contribute to this important initiative at the same time. 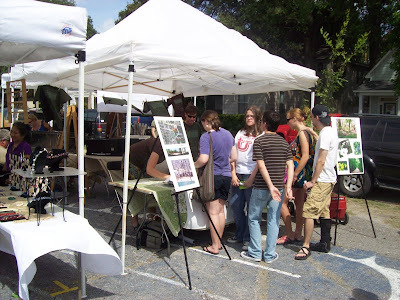 We will of course credit your photo in the Sustainable Shelby plan and on the website. We'd prefer higher resolution digital color photos, but we will gladly accept any original digital image that you would like to contribute. 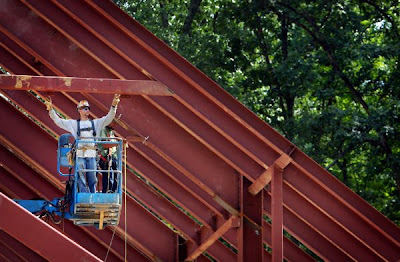 Please send digital photographs to photos@sustainableshelby.com and include a brief written description of the photo and let us know where and when it was taken. 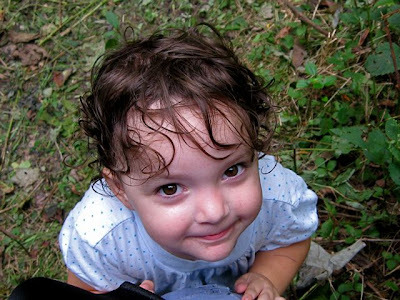 Please submit your photos anytime between now and October 8, 2008. There is no limit to the number of photographs that can be submitted per person. Thank you in advance for your help with this exciting project! - Or anything else that you love about Memphis and Shelby County! 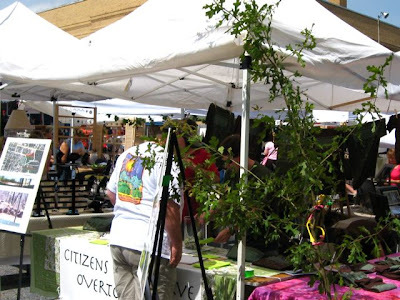 CPOP spent this past Saturday at the 21st annual and ever fun Cooper-Young Festival. All of our board members pulled shifts in the booth: Amy and me in the morning; Naomi, Greg and Jimmy in the early afternoon; Stacey and Lenore until Festival end. 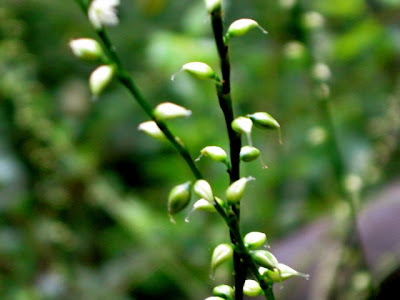 We were awed by the reception the Old Forest received from Festival-goers. With incredibly few exceptions, the Old Forest received love and support from those who stopped by. And many, many stopped by. 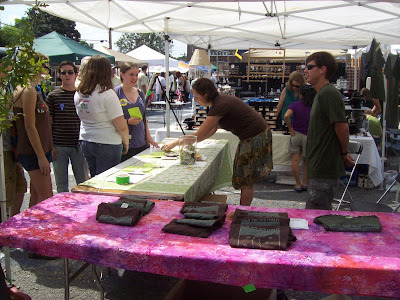 We were in the far southwest edge of the Festival, near Blythe and Walker, but we had a great corner booth. 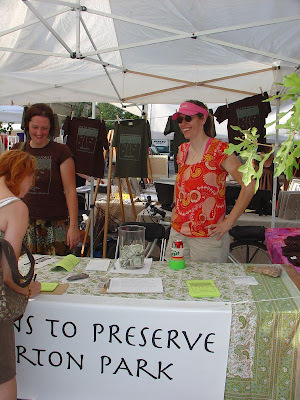 It was an ideal location to tell folks about the Old Forest, answer their questions, sign them up for our mailing list, invite them on our twice-monthly hikes, hand out our stickers, and sell CPOP's brand new t-shirts. In fact, the t-shirts were so popular, thanks to the beautiful design by Warren, Stacey and Naomi, that we ran out of the adult sizes before 2 p.m. and ended up selling all but 3 before the Festival closed at 7 p.m. We'll soon have a store up for anyone who wants to purchase a size that wasn't available. 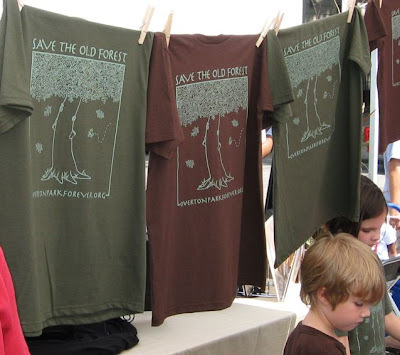 Raising the money was good but it's better still to see "Save the Old Forest" all over Memphis (and beyond) on 100+ t-shirts and countless stickers. Thanks to everyone who paused to ask questions, sign-up, donate, and buy t-shirts. 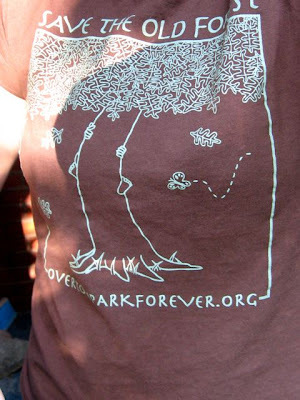 If you're new to our cause, bookmark this site, then visit the Old Forest. Y'all come on down to the fabulous Cooper Young Festival tomorrow (Saturday, September 13) and visit with CPOP. Our booth number is D-31, in the parking lot south of First Congo. The festival opens at 9am and shuts down at 7pm. We'll have plenty of stickers to give away, we'll have postcards for your City Council reps, and any donation of $10 gets you one of our brand-spanking-new CPOP shirts! These are 100% organic cotton shirts. We have two colors (earth brown and forest green) in these unisex sizes: Youth Extra Small, Youth Small, Youth Large, Adult Small, Adult Medium, Adult Large, and Adult Extra Large. If you want a shirt but can't attend Cooper Young, just email us and we'll figure it out. 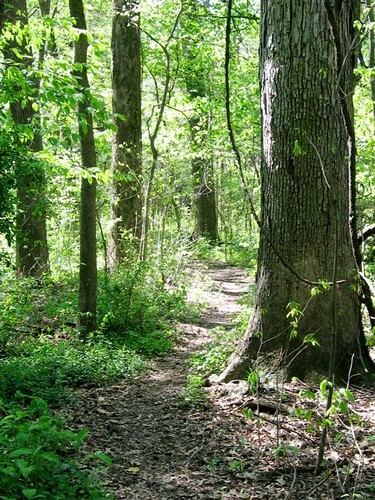 And if you're in the mood for a walk in the woods, don't forget that we hike the Old Forest tomorrow morning at 10am. Meet at the east end of Old Forest Lane next to the Rainbow Lake parking area. As always, kiddos are welcome. Don't forget to cast your vote. UPDATE - Here are the Commercial Appeal poll results as of Friday morning, September 12. It looks like the poll is still open so click on through if you haven't voted yet. Since we hadn't heard a response to our request to tour the 17 acres with President Chuck Brady, I followed up with a phone call the week before Labor Day. The next day Mr. Brady called me back. A few weeks ago when we saw a bunch of fireflies on one of our hikes, Jiro got really excited. That was the first time I ever saw him actually try and catch a bug. (Unlike Satchel who is always catching something.) Sunday Jiro was busy picking up acorns, pointing out Daddy Longlegs, etc. He was really into it and didn't ask to be carried or make a single complaint. I liked your article on the controversial zoo expansion ("Out of the Woods," August 14th issue). 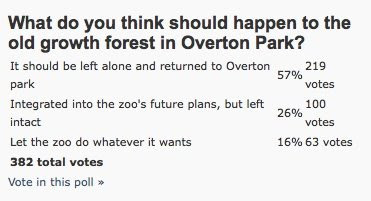 I wish you had mentioned the Memphis City Council's recent discussion of the zoo's expired 20-year master plan. Councilwoman Ware said something to the effect that the city will be the laughingstock of the nation if the Memphis Zoo is not allowed to expand and cut down forest in the name of progress. I disagree. The Teton Trek clear-cutting is a shocker because most of the rest of the country has moved forward environmentally. The old zoo master plan was written before the end of the Cold War, the Internet, ozone holes, global warming, environmental degradation, and habitat loss. Have we in Memphis not learned? Do lessons apply to Brazil but not to Memphis? Does a "world-class zoo" official need to act like a third-world cattle rancher? The 17-acre Chickasaw Trail is a racket. Is nobody noticing the scam? In Memphis, progress is FedEx runways to fit the A-380. When it comes to environmental issues, this city's slow bus has not reached the 21st century. Freeways through the Amazon isn't progress, Mrs. Ware. 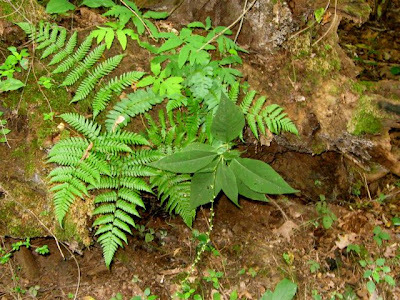 It's apathy, indifference, and hypocrisy that will make us the laughingstock of the nation — and squandering a national treasure like a primal forest. Your article about the zoo was informative but a bit tame. Would you people at the Flyer please put your teeth in when you touch controversy!? 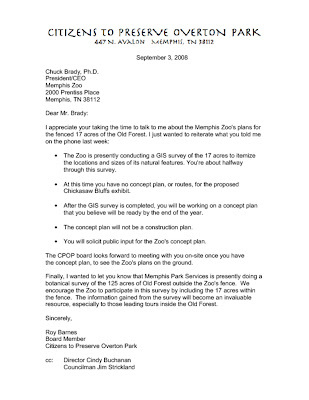 Why do you quote spokespeople and not the man, Memphis Zoo CEO Chuck Brady, who's ultimately responsible for making dubious decisions? Why does a zoo have a spokesperson anyway? Don't try to approach the director of the Memphis Zoo. An audience with the pope might be easier. Spin-meisters are important when one has to sell forest clear-cutting, I understand. One should hire many of them and hope they answer the phone. 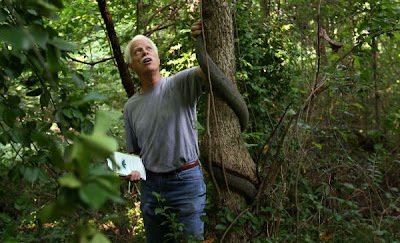 The pesky tree-huggers (the Citizens to Preserve Overton Park) aren't nut cases — just mothers and fathers pointing out that somebody has done wrong and they don't trust the director with any plans for another 17 acres of previously unmolested ancient forest. Sure, the zoo website promptly promised an adorable nature walk on stilts for disadvantaged inner-city kids, but that stilt shtick is nothing more than the sly fox volunteering to guard the henhouse. How much financial damage and how much foregone goodwill is a nonprofit institution willing to accept when a CEO has managed to anger and divide a city with poor management choices?